*I have used affiliate links for your convenience and these links are to products that we actually use and love. – this matte poly looks and feels AMAZING! 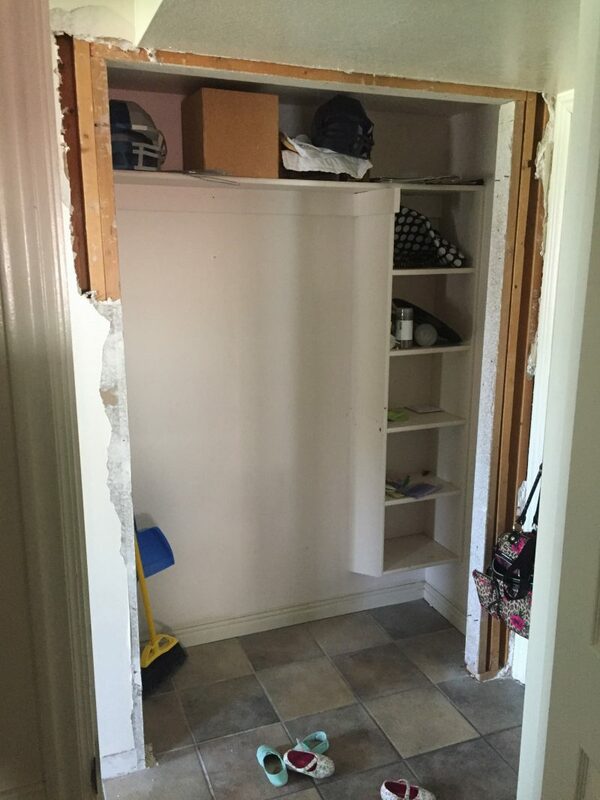 The first step is determine if your closet wall is load bearing. The best way to determine this is to have a contractor check it out. We determined ours was not structural because it was in between (perpendicular to) an exterior wall and a load bearing wall. The floor beneath this space was open as well, no wall support beneath it. Also, when we removed the drywall we were able to look at the framework and it was obvious it was not supporting any weight. This step was important to me because I wanted the mudroom to look like it belonged, instead of an afterthought tucked in an old closet. It was well worth the extra work! In this image we were removing the drywall and about to cut out the studs. Next, remove your drywall, trim work, and framework. You will likely have to fix your flooring where the old framework was. We got super lucky and found tiles that are almost identical to our original ones. My plan A was actually to paint the floor following these instructions. But plan A was assuming I could not find tiles that would match ours… sometimes I still toy with the idea of painting these floors – it would be so much fun! Determine where your studs are using a stud finder. 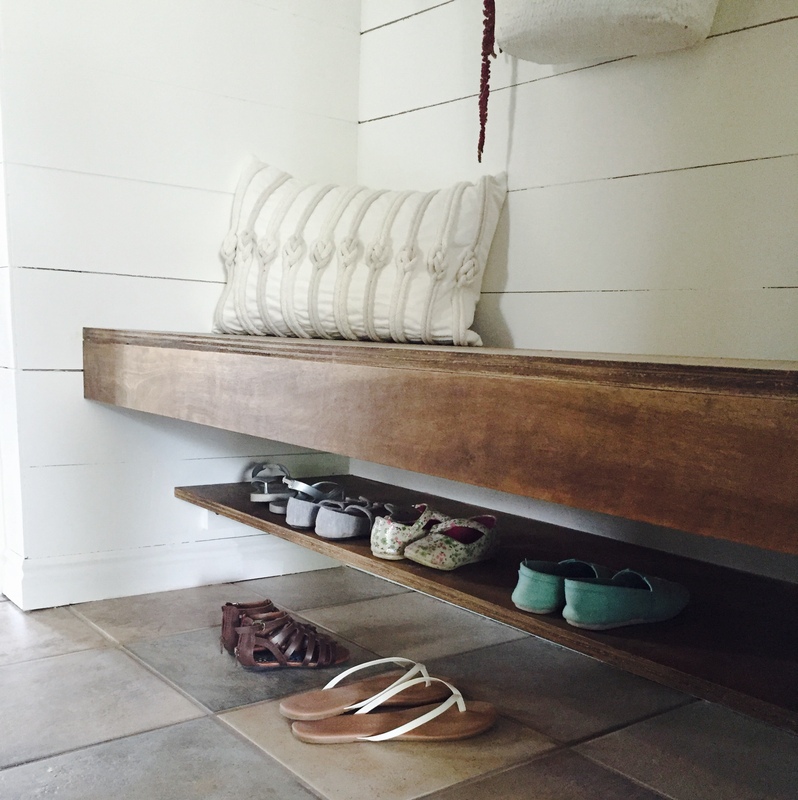 You will be using the studs as anchoring for your bench and shoe shelf. Our studs were 19 inches from the back wall on the right side, and 20 inches from the back wall on the left. So we made our bench 21 inches deep. It is perfect, not too deep at all. It is also wide enough to sit an infant carseat on it ;)! We had some spots where we needed to patch the drywall. I was putting up shiplap so I didn’t smooth the drywall seams or worry about texturing. If you aren’t putting up shiplap you will want to tape your drywall, texture, and paint it. In the image below you can see the skinny strip of drywall I screwed into the wall, this was just for extra support since the shiplap is only 1/4 inch thick. I followed this tutorial from LizMarieBlog for putting up our shiplap. It was a great tutorial and we ended up spending $45 in shiplap! So cheap, and so fun to do! SHOE SHELF: After the shiplap was up, we built a 3-sided frame along the 3 sides of the closet alcove for our shoe shelf (the lower shelf, see pic below). Wait to lay your solid piece of wood on top until after you have finished the bench above (we didn’t and wished that we had). We built the shoe shelf 8 inches off the ground, and it is 15 inches X 58.5 inches. It is nice that it isn’t the same depth as the 21 inch bench so that we aren’t knocking our legs on it as we sit down. I was also worried our shoes would get lost in the back if it was 21 inches deep. AND it looks nicer since your shoes are tucked back out of the way. *NOTE: we did not screw the shoe shelf into the studs here, we figured the shiplap and drywall would be enough to hold the weight of our shoes. BENCH SEAT: Now build your bench frame. We decided on one joist, but you could add two if you wanted extra stability. Our frame is 21 inches X 58.5 inches. We drilled our frame into the wall where the studs were. Our bench is 18 inches off the floor. If you are new to wood work, check out this tutorial from Ana White for more detailed instructions. Next we put wood glue along the top edges of our bench frame (don’t forget to put it along the top of the joist). We laid the top plywood on the frame and put some heavy paint cans (or kids!) on top for 24 hours to hold it in place. Make sure that your top plywood overhangs the frame so that your “faceplate” piece (the piece that will cover the front part of the frame) will be flush. For the front “face-plate” we used clamps to hold it in place while we drilled from the backside (from the frame side) so that there would be no marks on the wood front side. Our face-plate measures 3.75 inches X 58.5 inches. We used a couple shims* to get our wood to line up perfectly with the bench top piece. *A shim is a thin and often tapered or wedged piece of material, used to fill small gaps or spaces between objects. Shims are typically used in order to support, adjust for better fit, or provide a level surface. Then lay your plywood on the shoe shelf frame using wood glue to hold it in place. Be sure to clamp it or place something heavy on top until it is dried. We stained our wood using Minwax Dark Walnut. It is a gorgeous color and picked up the wood grain beautifully! After it dried completely, we covered it with Ultimate Polyurethane in Matte. I was only able to find this on Amazon. Home Depot and Lowes didn’t carry it. This poly is awesome because it is super durable, not shiny, and scratch resistant. We then added hooks and baskets, and we were finished! Phew! 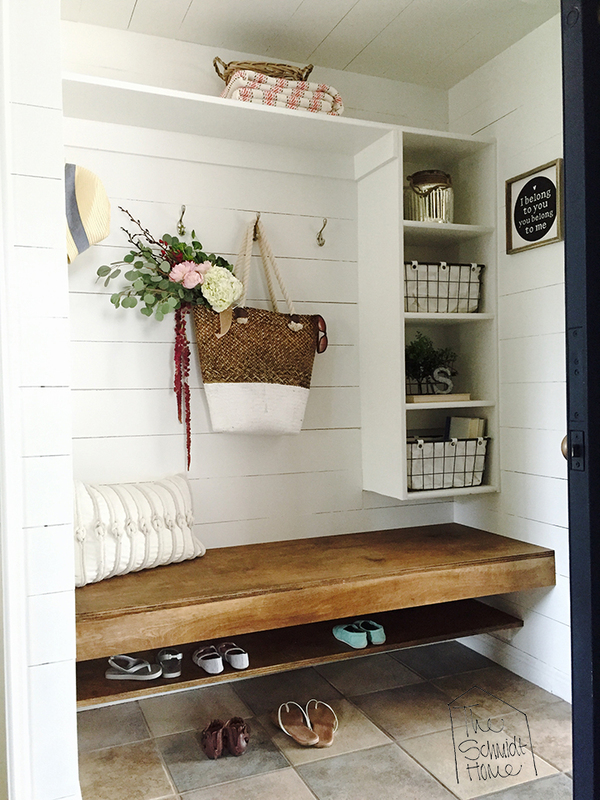 This mudroom took us a few weeks to complete, but it so so worth it! It looks amazing. 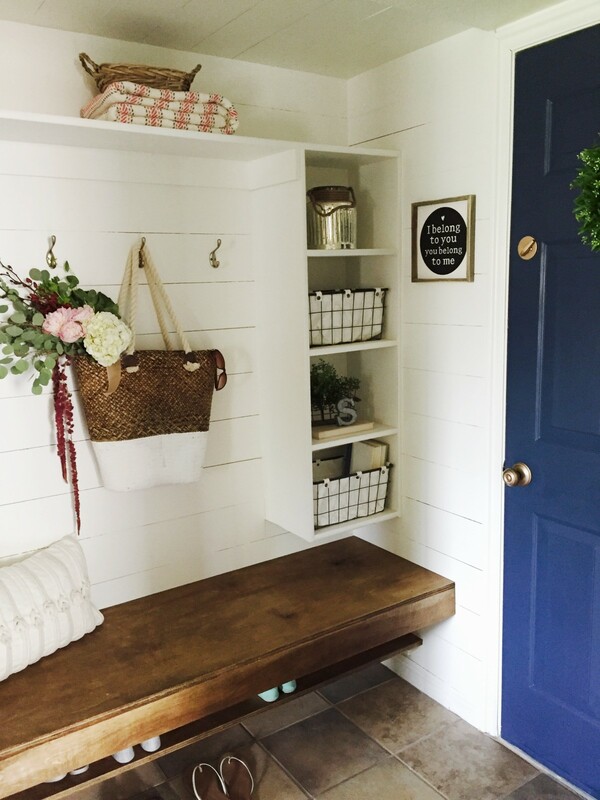 If you are looking for some mudroom inspiration, I have a whole board on Pinterest where I collected ideas for this project. I also share more projects and inspiration on Instagram, stop by and say HI! Thanks for stopping by! 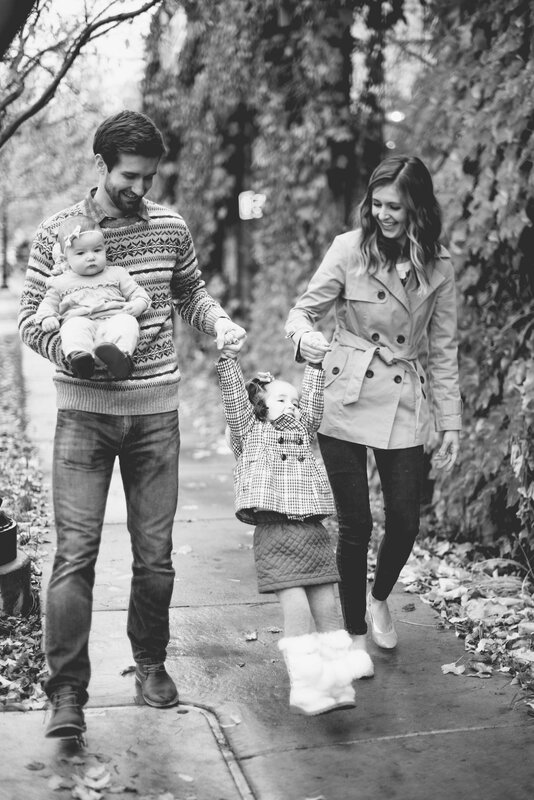 I truly appreciate every comment and your support of this little blog of mine. We are a participant in the Amazon Services LLC Associates Program, an affiliate advertising program designed to provide a means for us to earn fees by linking to Amazon.com and affiliated sites. All recommendations are products that I actually use. This is beautiful!!! Can I ask where you got the ‘I belong to you, you belong to me’ picture?? Hi Jessica! It is from Hobby Lobby :). Love their signs! We copied your design and love it! Thanks for the post! Oh I am so glad you took the time to comment. So glad you love it and that the post was helpful! 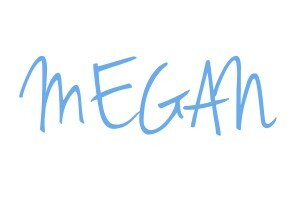 If you ever feel so inclined, send me (or tag me in) a picture! I would love to see it ;). 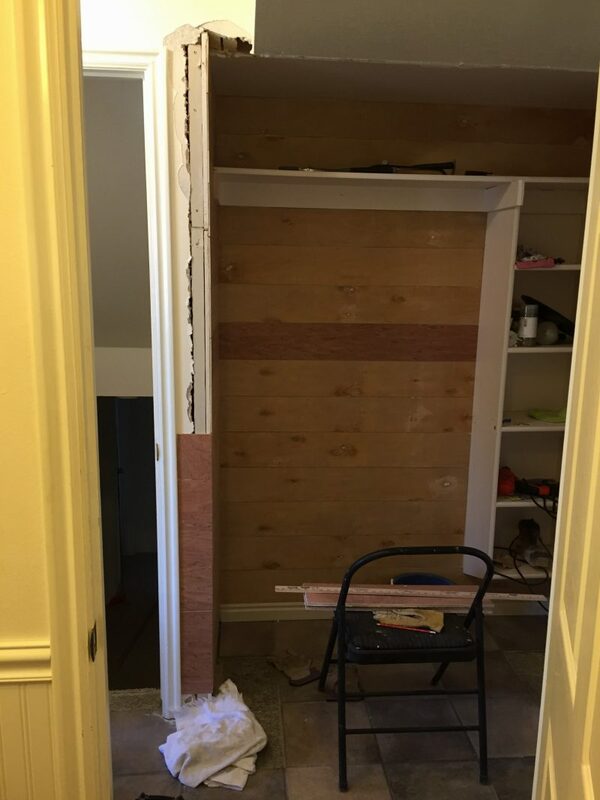 Hi Misti, the tile was already there when we bought the house, but we added 4 tiles when we removed the old closet framework. I had to find something similar and we got lucky and found an almost perfect match at the Home Depot. I am not sure what the name was, and it was almost 2 years ago. Hopefully they have something similar still for you! I am sorry about the long delay in my response, I’ve taken a hiatus from blogging and am just now starting back up. Good luck with your projects! It is hard to say since we had most of the tools on hand. If you have basic woodworking tools (saw, clamps, glue, etc) you could easily do this for $150. 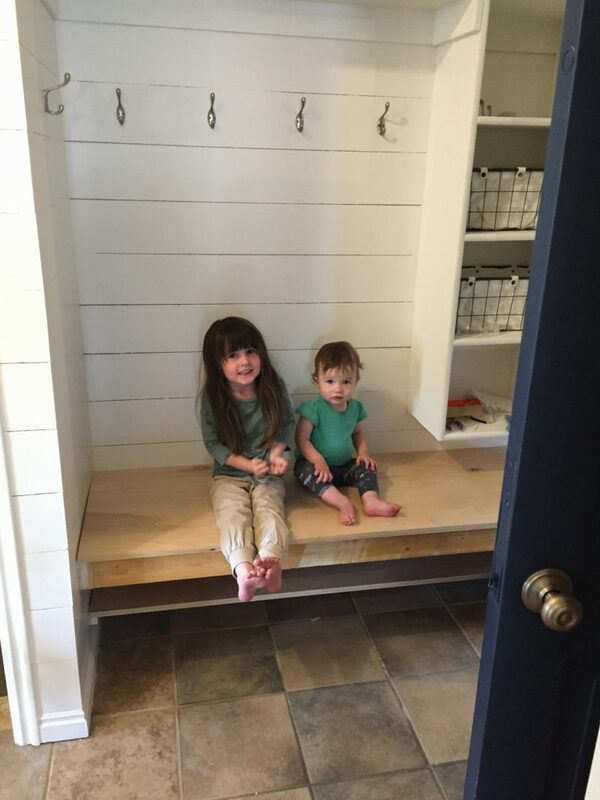 We spent $45 on shiplap, $50 on wood for the bench, and the other $50 is for things like the hooks and polyurethane. I just added a lot of links at the top of this tutorial to help you (and others) see the products we used more easily. Good luck! This looks fantastic and super functional! What is the dimension of your shelf cubby? Love this look! Definitely going to pull some ideas from this! May I ask where you got that adorable wicker bag? It is from Hobby Lobby. I am sorry I am just getting back to you for this! Love your design and the shiplap. 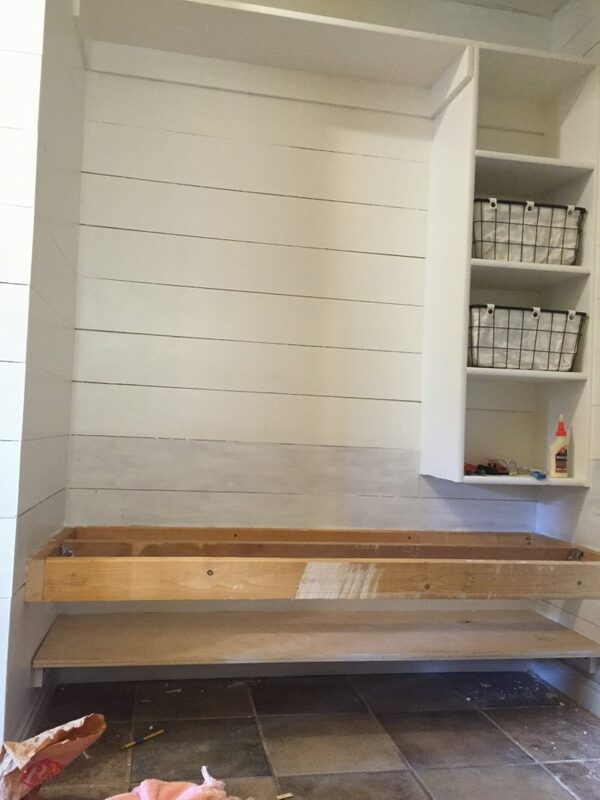 Was curious how you did the corners for shiplap where it meets on front of the end/short wall (wrapping around to the left when facing bench). Are they mitered corners? Also what material is the shiplap? Was thinking it is plywood since you refer to link LizMarieBlog, and you mention 1/4″ and $45 spent in the details but I don’t see it on the materials list. Hi Denise, the shiplap is just butted up in the corners with a straight cut. We used 1/4″ plywood and I do not think it would miter well. I hope this answers your question. I just re-read, you are asking about the outside corner. I have the shiplap on the front cut longer on the short wall to cover the raw edge from the front. I have also seen people use corner trim to do this for a cleaner look.